Approximately 180,000 Western Gurung people live in the Kaski, Syangia and Parbat districts of the Gandaki Zone in central Nepal. According to the 1991 census, 72,000 people can still speak the Western Gurung language, just over 50 per cent of the population. The rest speak Nepali as their first language. Over the past two hundred years the Gurung have migrated into surrounding nations. There is a community of Gurung living in the Samtsi District of south-west Bhutan, where they are commonly labelled as Nepalis. 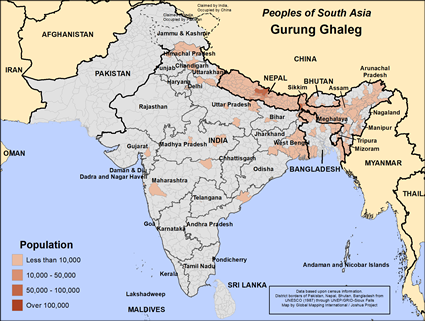 In India, Gurung communities can be found in the hilly terrain of the South, West and East districts of the state of Sikkim, throughout the Darjeeling District of West Bengal, and around the city of Dehra Dun and throughout the Pithoragarh District in Uttar Pradesh. 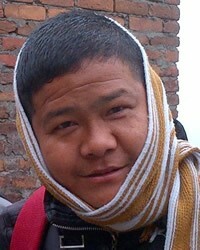 In India, the Gurung have not been recognized as a Scheduled Tribe. Consequently population figures are not available for them, but they probably total a few thousand. Gurung history is clouded with uncertainty because of their lack of a written script in the past. Legends were handed down orally from one generation to the next. We do know that, during the 15th century, a Gurung king named Ghale Raja was overthrown by a Nepali king. In the 16th century the Khasa armies took over large tracts of land in Nepal and the Gurung came under their control. The Gurung were highly regarded as fighters and many of them were enlisted in the Khasa's armies. Later, after the British took control of India, many Gurung men were enlisted as Gurkha soldiers in the British army. Thousands have served in places from Hong Kong to Bosnia and the Falkland Islands. Less than one out of every thousand Western Gurung people are Christians today. One source found there to be just 23 known Western Gurung believers in 1997, but this number has increased in recent years. The Western Gurung New Testament was first published in 1982, but it has fallen out of print since because of the small number of Western Gurung Christians and because there is no demand for it. View Gurung in all countries.